antibacterial, antiseptic, antispasmodic, antiviral, anticancerous, analgesicdecongestant, diurectic, disinfectant, estrogen-like properties, immune stimulant, grounding. 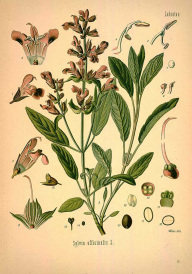 Sage was once known as the "master healer" due to its ability to strengthen the organs, nerves and lymph system. It's Latin name Salvia even means "salvation". Along with strengthen the body and immune system it balances hormones and aids in all "womanly issues", which is why you want to avoid this one while pregnant and nursing. It also has long been used for oral problems of all sorts. Apply directly to area of concern, on the bottoms of the feet or Vita Flex points. respiratory infections, asthma, bronchitis, croup, etc. lymph system support, lymph congestion, gland disorders, etc. Use with caution if you choose to take internally. Avoid if pregnant or nursing, if you have epilepsy or high blood pressure. Best to avoid using with children.